Paroli is a form of positive betting progression. Its name derives from the Latin term, par, meaning “one that is equal.” In its simplest form, the system can be thought of as doubling a wager after each win until three consecutive wins are achieved. This tactic has been employed with some success since the 16th century, when it was commonly applied to an Italian card game known as Basset. Today, the Paroli betting system is most effective in wagering on roulette and baccarat, although it can be used for any game featuring even odds bets, including craps, Sic Bo, Pai Gow poker and, with some modifications, even blackjack. How does the Paroli betting system work? The object of the Paroli betting system is to obtain three consecutive wins in a row, while doubling the wager with each win. To begin the progression, a single unit is wagered on an even money outcome, such as betting on Black at the roulette table. If the wager loses, one unit will be bet again. The player will continue “flat betting” in this way, never varying the amount bet, until the wager wins. Then, following a win, the player will bet two units. If this bet loses, the player will return to wagering one unit. However, if the two-unit bet wins, the next wager will be doubled again to four units—the final bet of the progression, win or lose. The wager will result in either a net loss of one unit or a profit of seven units and a new progression begins. What is the logic behind the Paroli betting system? This strategy rests on the premise that wins and losses tend to come in streaks. A player can maximize profits by betting more during winning streaks and less during streaks of losses. The Paroli betting system further ensures that no wager will ever risk more than a single unit from the player’s bankroll. Larger bets are made possible by units won from the House, and each time a succession of three wins occurs, the profit is seven units, which should cover the accumulated small losses. Adherents say the Paroli system is much more stable and consistent than negative betting progressions. What’s more, unlike many other systems, Paroli does not require a substantial bankroll. When losses occur, they are gradual and unspectacular. Also, table limits are never a barrier to successful completion of the progression. Why is the Paroli betting system flawed? 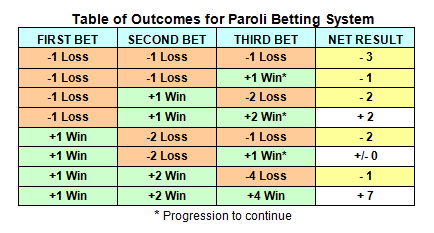 The risk of playing the Paroli betting system exclusively is that the accumulation of one unit losses can far too easily exceed the 7-unit wins required to pay for them. As shown in the Table of Outcomes (see above), there are five patterns that lose money on three bets, one that breaks even and only two patterns that yield a profit. The net result of all patterns is neither a profit nor a loss, but a zero sum. That means the system will be successful only when the game is streaking in the player’s favour, which is obviously true of most betting systems. Moreover, because the House has an inherent edge in all wagering, the probability of a loss on any particular even-money wager is slightly greater than the likelihood of a win. Specifically, for European roulette, if the system is applied to wagers on Black, a loss will occur not only when a Red number comes up but also when the Zero occurs, thus making a series of three wins in a row statistically less likely than the simple Table of Outcomes might imply.